When you arrive back to work after your Christmas and New Year break it can seem a very long time to the summer and those lazy hazy days drinking Pimms (other drinks are available). So as in previous years one of the first emails which arrives, comes courtesy of the adjutant, this year on the 6th January giving serving personnel the opportunity to apply to attend the Queen’s Garden party. Being in my 40th year of service as either a Regular Soldier, TA Soldier or as an NRPS (SQMS) I figured that this year it must be my turn. Lets fast-forward to the 23rd of April, and many celebrations in the Standley house as it is our 26th Wedding Anniversary. I departed for work with the words ‘ thought you could at least have had the day off to be with me, I have taken time off’ (whoops!) Then I receive a call mid-morning asking what I have done wrong as there appears to be a letter from the Palace. I think I may know what it is, and sure enough we had been fortunate enough to receive an invite to this year’s Queen’s Garden Party at Buckingham Palace. My thoughts immediately turned to ‘jeez how much is this going to cost’? Top-up Oyster card…..yup forget that taxi only, if you like. Premier Inn…you get the idea. So off we set to attend on the 3rd June on a lovely sunny day. We arrive in London in good time to check into our hotel, get dressed into our outfits for the day; with the wife looking pretty good in a spotty number with various matching items. And, if I say so myself, I looked pretty cool too. 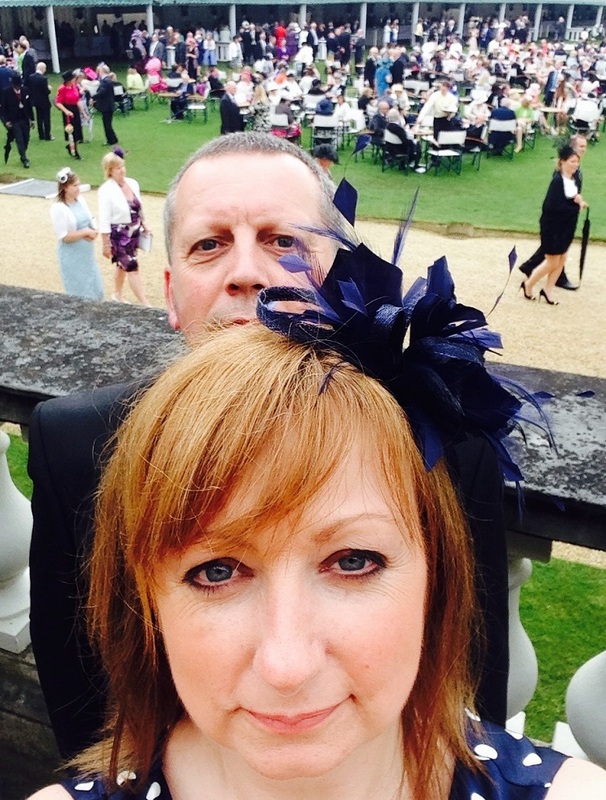 We left in good time to arrive at the palace for about 3.15pm and on arrival we joined the queue with other attendees. We spent about 15 minutes in the queue, then we were into the main gate after the first security check had taken place. You get to walk under ‘THE BALCONY’ and through the courtyard and the inner quadrangle and finally through the rear part of the Palace for the final security check and on into the garden. The garden is laid out with 2 long marquees and 2 military band areas and the Royal tea tent (for invited guests only) along with numerous tables and chairs dotted around the grassed area. It is a very, very big garden. At approximately 3.55pm the Royal party arrived headed by the Queen with various family members including The Duke of Edinburgh, Prince Charles and Camilla, Prince Edward and Sophie and also many of the younger members. The event then starts with the National Anthem. This year it was followed by what can only be described as a downpour of biblical proportions, which then changes all the plans for the day so instead of 4 different Royal groups mingling about, the Royal family are ushered to the Royal tea tent with attendants producing brollies, as if by magic! With all the other guests all trying to squeeze into a marquee that is probably large enough for about a third of the invited guests. It was at this time we realised that the expensive matching brolly was indeed not that much use – it was still in the hotel room! Still with military guile and not a small amount skill we managed to find our way to the front of the cake and sandwich queue where we selected from such as an ice coffee or tea, sandwiches cut into soldiers with no crusts, made of various fillings including Cucumber and Mint, Egg Mayo, Smoked Salmon, Gammon Ham to name but a few and many various other nibbles along with a selection of very small but exceedingly tasty cakes which included Dundee cake, Victoria sponge, Strawberry tart all served on the smallest plate in the world, I kid you not. But all very pleasant nevertheless. Then as suddenly as the rain started out came the sun, so time to leave the marquee and explore the gardens. Many people were taking photos and no one seemed overly concerned (but none of inside the house). The gardens and the lake at Buckingham Palace are huge and it took around an hour to walk round soaking up the atmosphere of the day and to be fair, mainly people watching and having the occasional laugh at the ladies sinking their heels in the grass. The afternoon finishes off once again with the National Anthem and as the Royal Party retires, the guests then start to leave. It is quite amusing how the guests become a tourist attraction themselves as on the way in and out there are many people photographing us. The history bit now, the Queens Garden Party albeit originally a breakfast party, primarily for debutants and the likes started in the 1860s by Queen Victoria and took place twice a year but by the mid 1950s there were now 3 a year and took the form of an afternoon tea party between the hours of 4 till 6 pm and along with the Royals there also present are the Yeoman of the Guard, Gentleman at Arms and Gentleman Ushers. 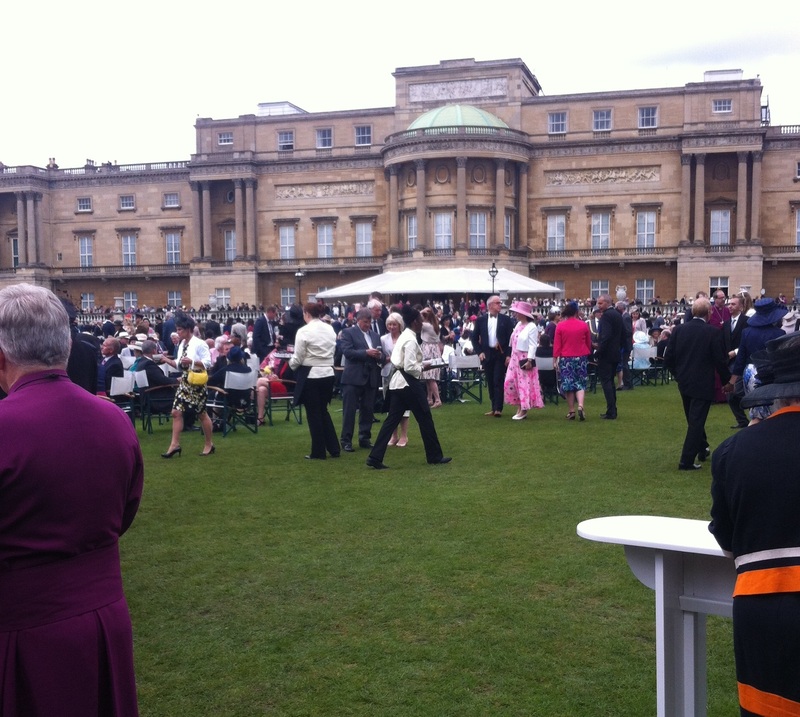 At the garden party, you will see and meet many members of the public and service personnel from around the Commonwealth, there is also numerous attendees from across all religious divides, classes and race. With people attending in National costume, or Service personnel in uniform (albeit not required), lounge suits or morning suits. With the ladies in a variety of outfits and hats (dress as if you were attending a wedding being the best advice). It is an event to be part of and savoured. Both my wife and I feel privileged to have received an invite and to be able to attend an event that is part of British history. 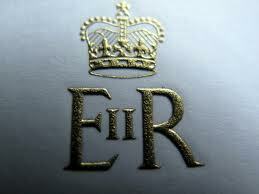 The Royal Stamp on the Envelope. 159 Supply Regiment Royal Logistic Corps (RLC) is an Army Reserve Supply Regiment, which is responsible for more than a million items of equipment, spares and stores of the Army. Its soldiers work alongside Regular troops from 102 Logistic Brigade; 6 Regiment RLC and 7 Regiment RLC. Members of the 159 Regt RLC run a regular blog http://159er.blogspot.co.uk and are sharing their story with us. A party of 12 soldiers from different squadrons of 159 Regiment RLC arrived at Kiel Yachting Club early in the afternoon of Friday 16th May. It was a beautiful place with views from the harbour looking across the Baltic ocean to the coastline of the rugged landscape of the northern fjords in Germany. Once all the logistics of accommodation had been organised we were introduced to the instructors and split into two groups, one for sailing the other for powerboating. After collecting our prospective wet weather gear for the following four days, the rest of the day was ours and we took the time to explore the local town and surrounding harbour area. Saturday morning began at 5am with beautiful clear skies but by breakfast fog had come in from the ocean reducing visibility to about 500 metres. However by 10am, beautiful blue skies again, a sharp warning of how quickly the weather could change in this area. The day began with a lesson in the classroom regarding safety and the aims of the course. We then all piled out to our various boats. 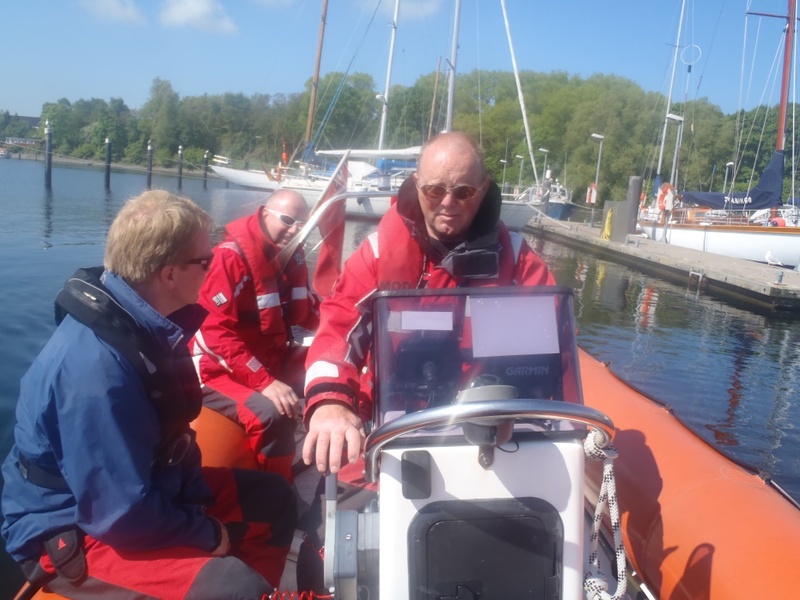 Myself, WO2 Williams (243 Coventry Squadron) and Sgt Johnson (123 Telford Squadron) made up a three man crew for our powerboat with instructor Nigel. We spent the morning learning basic navigation in the harbour. At a speed of 2 knots we learnt how to steer, moor and leave a jetty and how to keep a boat motionless. After lunch we left the harbour area and Nigel demonstrated controlled faster moves, at 7 knots, which we all had a go at. Below is Sgt Johnson practising steering with Nigel and WO2 Williams looking on. Sunday morning was spent consolidating low speed manoeuvres, learning how to turn the boat 180 degrees on the spot followed by some slalom navigating. We crossed the bay to Laboe for lunch and visited the German submarine. It was fascinating to see where so many men lived underwater in exceptionally cramped conditions, even the officers. After lunch we ventured further out into the ocean where we could travel up to 20 knots and learnt high speed turning and emergency stopping. ‘Bob’ was used for man overboard drills, which came in very handy as I was thrown overboard the next day, just hours after we were awarded our personal certificates for power-boating- enough said! 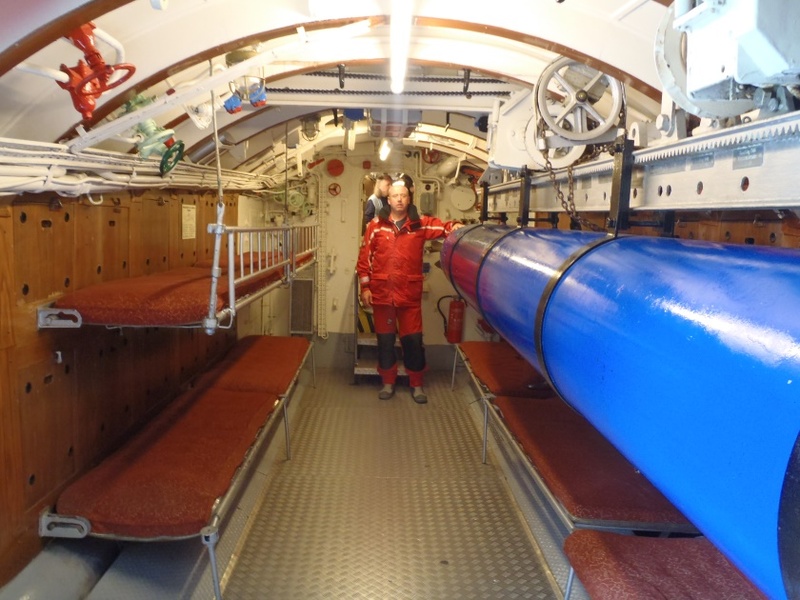 Sleeping quarters for seven men and a torpedo! Monday morning we took our test, which we all passed. To celebrate we returned to Laboe for their famous fish and chips. We spent the final hour of the afternoon speeding around the open ocean doing amazing figures of eight and just generally having fun. Our course only lasted three days, so all six of us who were on the powerboats had a spare day on Tuesday. 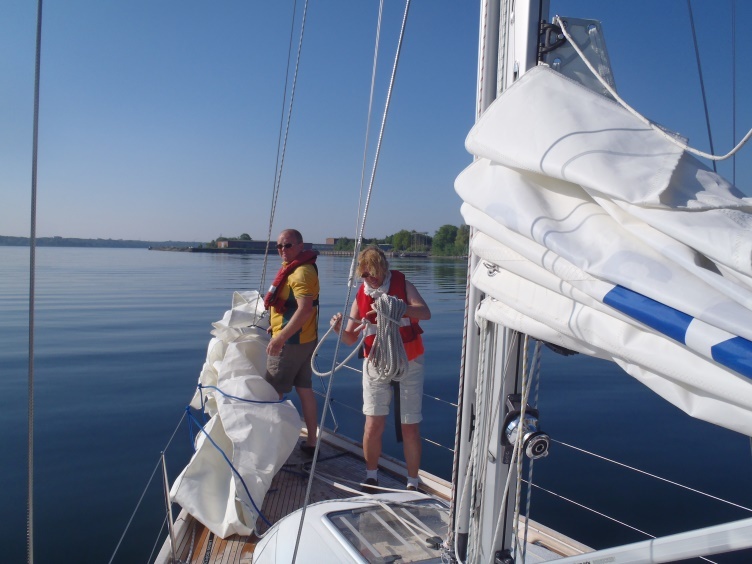 We were allowed to take a yacht out (with an instructor) to learn some basic yachting skills. This was a completely different experience from powerboating, a much slower but definitely more difficult skill to acquire. Me and Sgt Johnson are raising the sails. With beautiful weather, we again crossed the bay to Laboe. We visited the War Museum and climbed the Naval War Memorial which stands a staggering 279 feet above sea level. 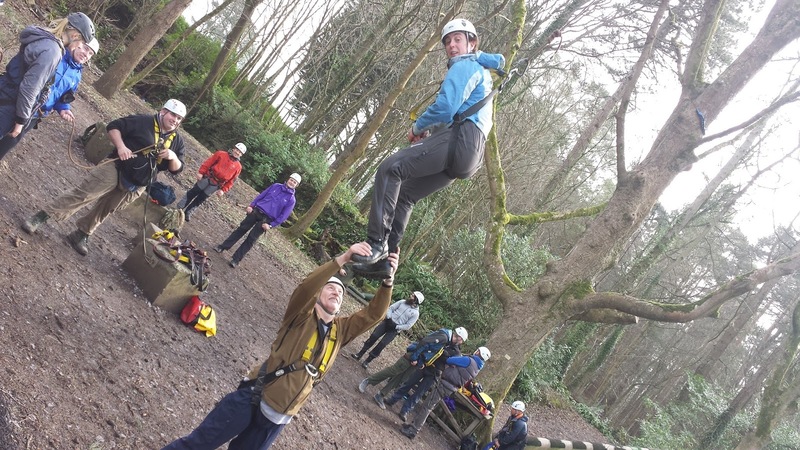 The whole adventurous training package was a truly remarkable and amazing experience. For more information on sailing and other adventurous training opportunities, all paid for, visit your local Army Reserve Centre or search for Army Reserve careers. 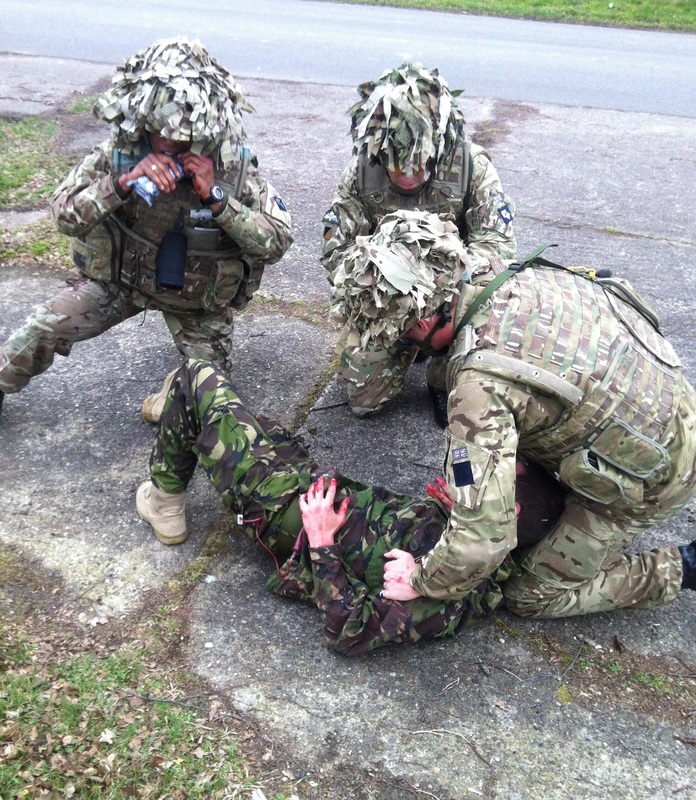 Reservists of 159 Supply Regiment deal with a ‘casualty’ during Mission Specific Training for Op HERRICK 20. My journey began in September 2012 when I first met my CO. Having just commissioned his first question to me was, “So, how would you like to go on tour?” 18 months later I find myself finishing Mission Specific Training (MST) about to deploy to Afghanistan. My path has changed slightly, from originally commanding a Transport Troop drawn from my own Regiment, 160 Transport Regiment, to commanding a Troop of Suppliers from 159 Supply Regiment. I now command Materiel Troop of 1 Logistic Support Regiment (1LSR) who deploy as the Theatre Logistic Group for Op HERRICK 20. The first stage of MST was the 159 Regiment Battle Camp. The Regiment has a strong history of providing supply capability, deploying a troop of 23 soldiers to Afghanistan every six months since 2011. The camp was an excellent introduction to the Regiment for me and allowed me to have an input into the selection of the lucky soldiers who were capable, robust and dedicated to deploy on operations. The next step was to travel to Germany and join 1LSR. Due to the changing nature of Op HERRICK 20, the Reserves were divided across the Regiment, with only 12 under my command in the General Support (GS) Squadron. Day One set the tone for the ethos of the ‘First Regiment’, with an ‘orientation’ run around the airfield – the first of many! The first week with GS Sqn included the Squadron Sergeant Major’s (SSM) parade ‘under the flags’. 1 LSR, and the GS Sqn particularly, contains soldiers from all over the Commonwealth and flags from each country represented are displayed on the hanger wall. I spent the majority of the week learning the ropes from the Technical Warrant Officer and practiced issues and receipts whilst asking lots of questions. Gaining an idea of what each department did, enabled me to ask the right questions during the hand-over with the outgoing Troop Commander. I felt fully prepared for the Field Training Exercise (FTX). 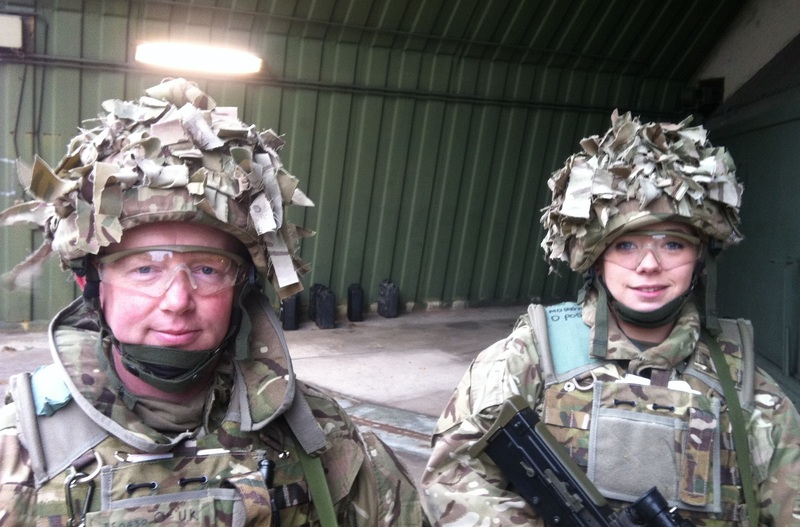 Reservists LCpl Jones and LCpl Molloy on Mission Rehearsal Exercise (MRX). The FTX was held at the Supply Training Facility (Germany) (STF(G)), a facility designed to test suppliers on the technical aspects of their trade. The Reservists had quickly gelled with the Regulars and there was little to tell them apart as soldiers and the previous training gaps were quickly identified and remedied; both through hard work from the Reservists and from excellent teamwork and tutoring from the Regulars. The FTX stretched everyone with a high volume of supply activity to be completed – mirroring the current operational tempo in Afghanistan. The FTX wasn’t just about trade skills though and there were plenty of ‘kinetic’ serials throughout to keep everyone on their toes. The next few weeks flew by, with leave and courses before the Mission Rehearsal Exercise (MRX). So here I am now at STF(G), on the final step and looking forward to the hot summer ahead. With many of my NCOs already or about to deploy, the remainder have had an opportunity to step-up and work in other roles, pushing themselves professionally than many had thought likely. As a Troop Commander my main priority is ensuring that my troops are ready to deploy in the best possible manner. The mobilisation process, from selection to MRX, has been challenging and rewarding. The pre-selection work ensured we arrived at 1 LSR with the right people to do the job and represent the Reserve Army on operations. The work done since has honed our skills, including mine, and been a positive experience which will see all of the Reservists deploy in as good a state as possible. On the weekend of 7- 9 March, 243 (Coventry) HQ Sqn set off on an adventure to the Island of Anglesey. A convoy of three vehicles packed with passengers and adventure training equipment made their way to the Joint Service Mountain Training Centre to begin a weekend packed of excitement, adrenaline fuelled and challenging fun, all for a cost of just £15.00. As each vehicle ‘de-bussed’ the troops were met by SSgt Khan (the Regular Permanent Staff Instructor) who gave each individual the good news that there was free Wi- Fi in the rooms – luxury in Army terms! After receiving the arrival brief, with beds made and kit packed away, we got some sleep before the weekend began on Saturday. 65 feet up in the trees! A sunny Saturday morning greeted us as we rose from our beds with rolling hills and sheep grazing, which is presumably the same as what they had done the day before, and the day before that and the day before that. After a bit of breakfast and plenty of flask filling we made our way to the Nuffield Training Centre in Llanfairpwllgwyngyllgogerychwyrndrobwll- llantysiliogogogochuchaf on the banks of the Menai Straits on the island of Anglesey in North Wales. No, I did not type loads of words, this is the name of the local area. I dare you to try to pronounce it. For those interested it means ‘St. Mary’s Church in the hollow of the white hazel near to the rapid whirlpool of Llantysilio of the red cave’. 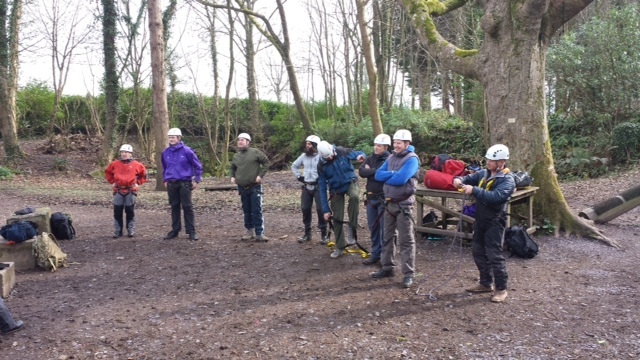 We were split into two groups and were each given an instructor who took us through a series of stands which included low wire activities, high wire activities, zip wiring and a trapeze jump. The low wire was quite exciting, it really tested your balance and co-ordination skills but as we progressed on to the high wire at a soaring 65 feet it definitely was enough to make the knees wobble and lips wibble! On each of the wires we had to make a steady climb up the side of a tree as it swayed from side to side in the wind and then believe that we could let go and walk across a plank whilst being supported only by a wire that was being held down by your mate on the ground. We were tasked with completing a full 360 degree turn and then a star jump before stepping off the platform to be lowered to the ground, some of us faster than others. Into the arms of safety. Next we moved on to the zip wire. We were to clip ourselves to the rope and then stand at the edge before our instructor kindly pushed us off. The only way we were going to stop was to either have our mates at the other end of the wire hold a wooden wedge down using a rope, or crash into the fast-approaching tree. The method worked well with the wooden wedge until Cpl Wright jumped off unexpectedly. Those of us who were supposed to stop him just carried on watching as he flew towards us. Luckily, LCpl Scrimshaw and I picked up the supporting rope just in time or he’d have carried out a really good impression of George in the Jungle. Moving on through the activities we got to the Trapeze Jump. As with the other activities we had to steadily climb up the side of a tree until we reached the top where a horizontal bar presented itself to us. 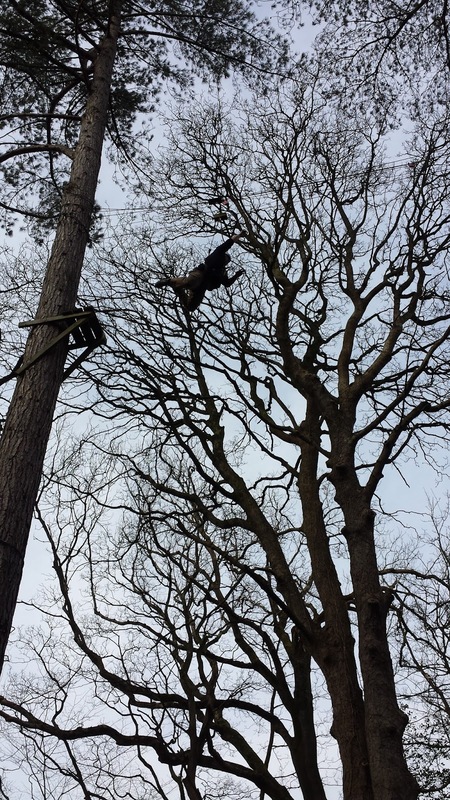 At 65 feet in the air with a tree swishing from side to side it takes a lot of nerve to have trust in yourself and your mate, who is stopping you from falling to the ground, beneath you, to jump reaching out for the bar… And missing! All of a sudden you feel like you are falling to certain death, the adrenaline rushes up to your head, heart beating faster and then you realize you’re not going anywhere, at which point your legs turn to jelly. For SSgt Coley (237 Squadron) this was particularly challenging. It took what seemed like an eternity for him to jump, but up there, I bet it felt like a lifetime for him. After some strong words of encouragement he made the leap of faith and flew to the bottom. A big well done to you. After this, we needed a break so we walked over the grass back to the training centre; something that none of us felt entirely comfy with as it goes against everything you’ve been disciplined in. Our last activity for Saturday was a race between the two teams to build a raft and work our way through a course designed by our instructors. After a tie between both teams and an allegation of cheating there was a forfeit. The first team with all members to jump into the lagoon won. As soon as were informed of this, with a few exceptions, all of us ran and got wet as our rafts naturally never sank. Getting wet however was not great when you didn’t have spare change of clothes… Ahem. At this point I should also point out that both instructors were incredibly knowledgeable and it was a pleasure to be with them both. Saturday concluded with a night out where all of us got together and made friends with the locals. Sunday was the end to a great weekend. The sun was shining again as we packed up our lives back into our bags and made our way to the Indoor Rock Climbing School, Indy. It’s Anglesey’s best rock climbing centre which is just outside of camp. It has beginner walls right through to the more advanced walls for real life spidermen. We spent two hours here and split into two groups ‘those that have’ and ‘those that haven’t’ which soon transpired into ‘those that can’ and ‘those that can’t’. By the end of the two hours I think it was fair to say that we all ended up into the category of ‘those that can’. The whole weekend was a steal, at £15 per person for travel, accommodation, food and equipment hire you can’t complain and it was good to see the squadron do things together as friends, things that are fun and things that we will talk about for a while. Of course the added bonus was that those that attended we getting paid to do these things too, something that others can only dream about. I’d certainly recommend Adventure Training to anyone. It’s something all the squadron should do together, after all, it’s not all work and no play is it? On behalf of all the Soldiers that attended, I’d also like to thank SSgt Khan for working extremely hard in organising this whole weekend. As a witness to endless work on the way down I can say that his phone did not stop ringing. Well done to all those that attended too, I think we smashed it and I believe the next AT weekend will be just as good, if not better.